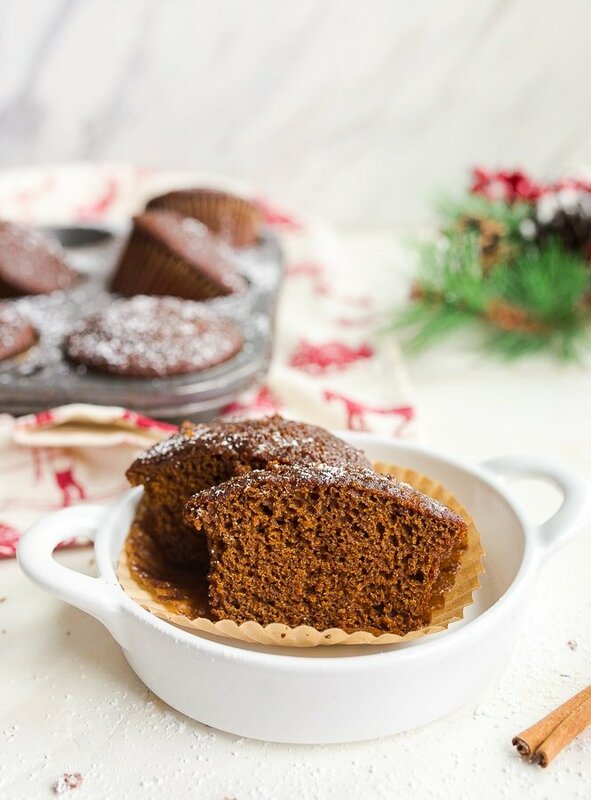 Gingerbread muffins are one of my favorite things to bake this time of the year! This recipe makes 6 muffins with all the classic flavors of Southern gingerbread. If you didn’t already suspect due to my intense masala chai obsession (don’t miss my chai cookie bars), I am a big fan of gingerbread. I love big, bold spices, and I love the slightly bitter flavor of molasses. The smell of gingerbread muffins baking in the oven is the scent of the holidays in my house. My grandmother made gingerbread frequently when I was growing up, and now that I look at the recipe, I see why. It’s a frugal little cake to make, often made with pantry staples. My grandparents grew up in the Depression years, though my Grandpa said they never noticed, because their gardens were bountiful. They were thankful to have plenty to eat. Luckily, times changed and things got much better, but those early baking years were formative for my Grandma. My grandma is the original ‘dessert for two’ gal, often scaling down dessert recipes simply because she didn’t have enough apples, or because it was just her and my Grandpa. I think she loved making gingerbread because it was made in an 8×8″ pan, and requires just one bowl. A single-layer, one bowl cake is so helpful in the kitchen! There is no doubt in my mind that my Grandmother’s gingerbread recipe is from Southern Living. The original recipe called for melted shortening, I believe, though it has since been updated with butter. I could be wrong about this, but I believe spices have been added to the ingredient list over the years. Gingerbread spices are traditionally ginger, cinnamon, nutmeg, cloves, and allspice. I add orange zest to my gingerbread almost every time I make it, because I think the citrus flavor brings out the warmth of the spices. It’s your call, though, you can absolutely leave it out for the more traditional take. Have you seen my gingerbread cut-out cookies made with fresh ginger? 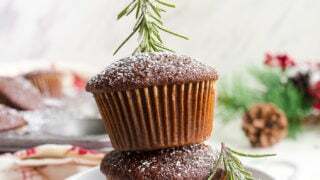 These gingerbread muffins are a scaled down version of the Classic Gingerbread Cake in this month’s Southern Living. Their recipe calls for an 8×8″ pan, and I cut the recipe in half and baked it in 6 muffin cups. My small muffin pan only bakes 6 regular-sized muffins. 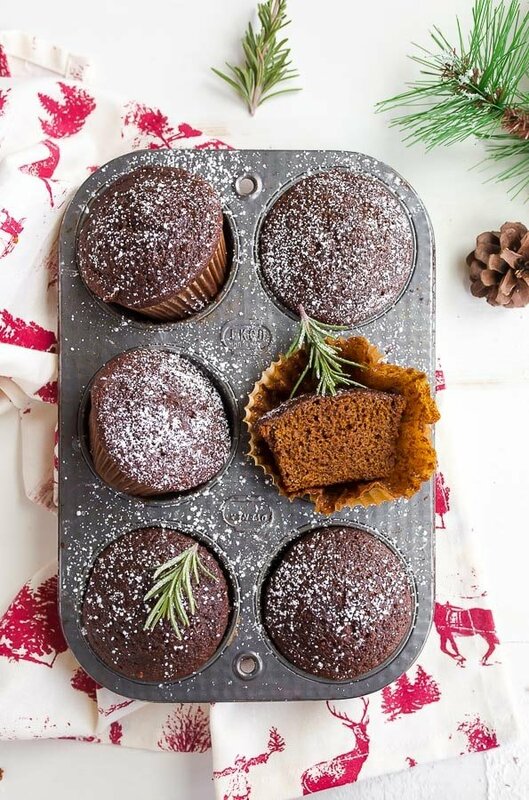 It’s the perfect amount of gingerbread muffins for two. One recipe note in the Southern Living version that caught my eye was to bake the gingerbread the day before you want to eat it, and let it sit overnight for the flavors to develop. I can attest that this is absolutely the best thing to do. Overnight, the muffins get spicier, slightly more dense, and more moist. 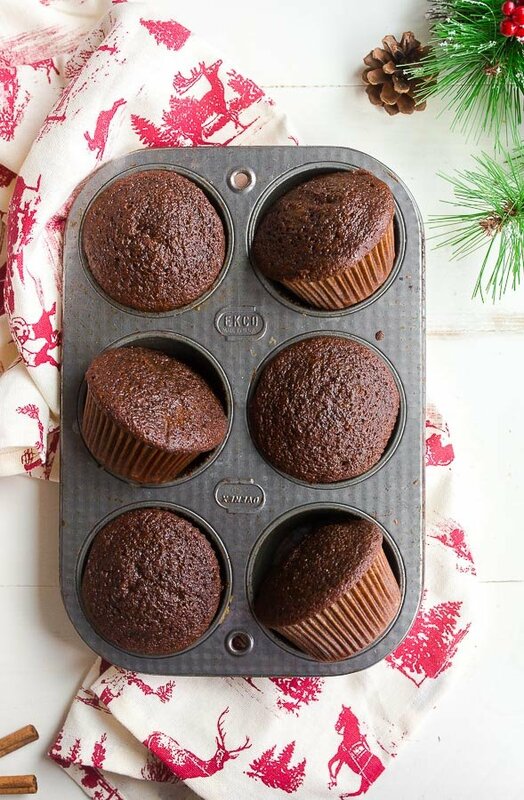 The tops of the gingerbread muffins get slightly sticky, so don’t let them touch anything while they rest overnight. One final tip: don’t use molasses that says ‘black-strap’ on the label, or else it can make the muffins taste like ham. Ok, maybe not ham, but this weird savory flavor that just doesn’t work with baking. I use the regular Grandma’s molasses with the yellow label; you can get it anywhere. This muffin recipe only uses the egg yolk of the egg; try my collection of recipes that use egg whites to use it up. A small batch of classic Southern gingerbread muffins. Preheat the oven to 350, and place 6 muffin liners into 6 cups of a muffin pan. Whisk together the brown sugar, molasses, boiling water and butter in a medium-sized glass bowl. Whisk until the butter melts, and then add the baking soda and salt. Set the mixture aside to cool for 10 minutes, whisking occasionally. Whisk in the egg yolk. Next, whisk together the flour and spices. Add this to the molasses mixture, and whisk to combine. Divide the mixture between the muffin cups, and bake on the lower third of the oven for 15 minutes, checking with a toothpick. Moist crumbs should cling to the toothpick, but it shouldn't be wet. It may need another 3-5 minutes. You can serve immediately, but they taste best if they're allowed to rest overnight in an air-tight container. *Don't use black strap molasses. Just made these for a brunch with some friends, they were SO delicious! Love your tip about letting them sit overnight, the flavors were phenomenal. Very experienced baker here, everything measured very carefully, but the centers fell (and never rose) on the muffins as they baked. Any thoughts on what to check? Thanks! PS Delicious all the same. I’ll make them again. Susan-could it be old baking soda?? I had the same trouble and my baking soda was fresh. Thanks for commenting I was concerned I had misread the recipe. I had the exact same problem with a brand new box of baking soda. When I used a toothpick to test at 15 minutes it just popped and deflated; still wet. Finished up at 400 convect for another 5 minutes. But all are collapsed in the middle. I think I might try in a greased pan instead of the paper cups next time – they taste good! Hello. How much orange zest do you add to the batter when you make these delicious looking muffins? Thank you! 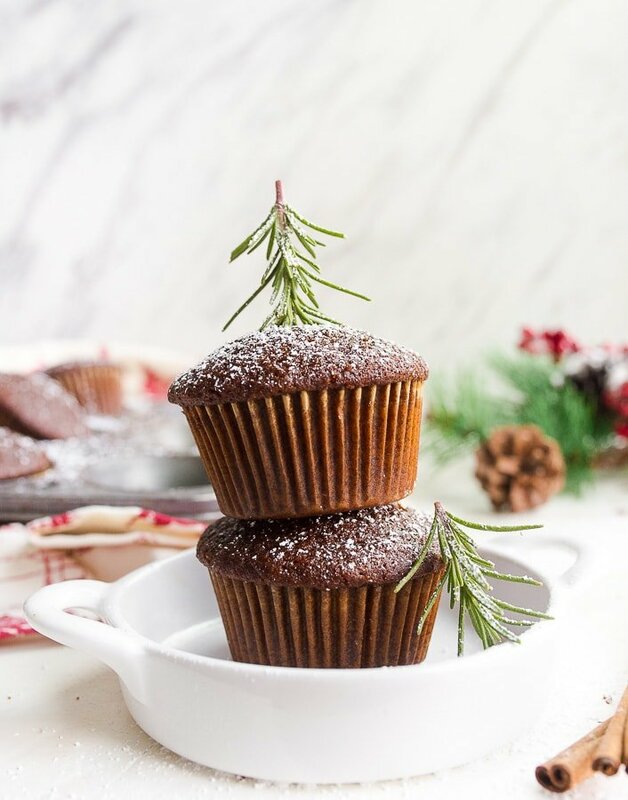 These muffins have absolutely the most perfect balance of gingerbread spices. And it’s true, they are better the second day and even better the third. I’m thinking next time I might add cream cheese frosting and call them cupcakes. So good. These were delicious! So moist! It did take the extra 3 Minutes but everything else was the exact recipe. It says here the egg white is reserved for another use but it’s not used anywhere…typo or mistake with the recipe? Mine were quite soggy as well. Use it for another recipe, sorry! Since I do small-batch recipes, eggs are often split like this. Did you add the egg white to the recipe anyway?